The second volume in The Chickamauga Campaign, David Powell's magnificent three-volume study of this overlooked and often misunderstood campaign. 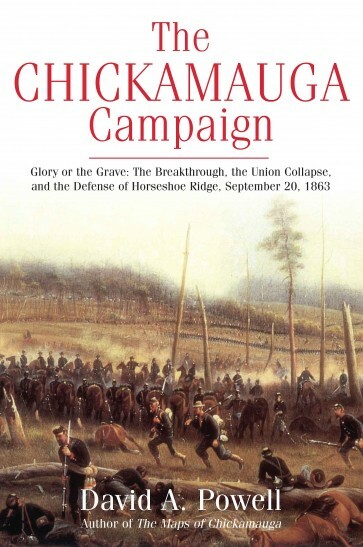 "Now in paperback, Glory or the Grave: The Breakthrough, the Union Collapse, and the Defense of Horseshoe Ridge, September 20, 1863 is the second volume in The Chickamauga Campaign, David Powell’s magnificent three-volume study of this overlooked and often misunderstood campaign. Chickamauga (Cherokee for “River of Death”), lived up to its grim sobriquet in September 1863 when the Union Army of the Cumberland and Confederate Army of Tennessee waged a sprawling bloody combat along the banks of West Chickamauga Creek. This installment of Powell’s tour de force depicts the final day of battle, when the Confederate army attacked and broke through the Union lines. The massive rout that ensued was ameliorated somewhat by an incredible defensive stand atop Horseshoe Ridge, which Powell carefully dissects at the regimental level. No one understands Chickamauga like Powell, whose crisp prose and cogent analysis are based upon some 2,000 primary accounts. The result is a rich and deep portrait of the fighting and command relationships on a scale never before attempted, let alone accomplished. The third and final volume, Analysis of a Barren Victory, covers the confused retreat and pursuit into Chattanooga, insight into the fighting and its impact on the war as a whole, a detailed examination into the strengths and losses of the two armies, and an exhaustive bibliography. Powell’s magnum opus, complete with 37 original maps and 40 photos and illustrations is the culmination of more than a decade of research and study and a complete understanding of the battlefield’s complex terrain system. For any student of the Civil War in general, or the Western Theater in particular, Powell’s trilogy is a must-read."